Originally published under the title "Heartbreaking Times." SURUC, Turkey – Kobani refugees faced a bitter winter on the Turkish-Syrian border, yet there was one bright spot: The fight to rid the Kurdish Syrian town of Islamic State jihadists was officially declared over on January 27. The Kurdish YPG militia, with the vital assistance of the US Air Force's 9th Expeditionary Bomb Squadron and additional coalition air power, drove the last of the jihadists out and planted the Kurdish flag once more over Kobani. They have kept up the momentum; more than 160 additional villages in what once formed the Kobani enclave have been liberated. The Kurds are now pressing up against Tel Abyad to the east of the city, and Jarabulus to its west. Yet for the civilian residents of Kobani, the story is far from over. Around 200,000 displaced people remain on the Turkish side of the border; they form the overwhelming majority of the families who fled Kobani last autumn, before US air support began, when it looked like the city was doomed. Concentrated in and around the border town of Suruc are 67,200 of the refugees, where a number of makeshift refugee camps have been established. Around 200,000 displaced Kurds remain on the Turkish side of the border. Refugees have also taken up residence in any available space, swelling the population of the town. Many of the structures are exposed to the elements, and lack even the most basic facilities. It is an acute humanitarian crisis – one largely ignored now that the fighting fronts have moved elsewhere. Last week, this reporter visited Suruc and the border area, seeking to gain a clearer picture of the reality facing both refugees and returnees. For the 4,000 or so who have returned to Kobani and environs, the main problem beyond the sheer physical destruction visited on the city is booby traps. Islamic State forces, before leaving, wired explosives to much of what remained intact in the city – including furniture, doorways and toys. "We need experts to come in and remove the unexploded bombs," Mustafa Alali, a Kurdish activist who was among the first to return to Kobani, tells me, "and then we need a humanitarian corridor for helping the people as they begin to return, with food, water and electricity." Most of those who have returned were formerly residents not of Kobani town itself, but of villages surrounding it. The villages were rapidly abandoned by the jihadists once Islamic State ceded the goal of conquering the urban area. As a result, houses in the rural points of settlement were less badly damaged in the fighting than those in the city. In Kobani town, little remains. Yet impatience to return is growing among the refugees.
" Just yesterday, a seven-year-old girl here in my office was asking her father why they haven't gone home yet to Kobani," says Mustafa Dogal, head of Kurdish relief efforts in Suruc, speaking in his cluttered office there. "And of course, he doesn't know how to tell her that their home simply doesn't exist any more." Hope for a "humanitarian corridor" from Turkey into Kobani runs up against the political reality of Turkish-Kurdish conflict. "People are running out of patience to return to their homes," Dogal continues. "There is an urgent need to rebuild houses, schools and hospitals, and for clean water and electricity; Kobani now has none of these. We are living in heartbreaking times." But Alali and Dogal's hope for a "humanitarian corridor" from Turkey into Kobani runs up against the political reality of Turkish-Kurdish conflict. The Turkish government appeared content to allow Kobani to fall to Islamic State; Turkish forces assembled to the north of the enclave during the battle made no move to intervene. This is because the Kurdish cantons in Syria are controlled by the Syrian franchise of the Kurdistan Workers' Party (PKK) – which has been engaged in an insurgency against the Turkish government for over 30 years. The conflict has left a legacy of extreme distrust between the Turkish authorities and Kurds on both sides of the border, and this is having a direct impact on the plight of the refugees. In January, AFAD (the Disaster and Emergency Management Organization of the Turkish republic) opened a new camp, offering accommodation for 35,000 refugees; thus far, only around 4,000 people have taken up residence there. "People are worried about going to the government camp," says Ferzad Daniel, an Iranian Kurdish relief worker in Suruc. "You need to remember that many of the refugees are Kurdish activists on one level or another; they're worried about retaliation from the government after the 'foreigners' leave." The absence of facilities for education in Kurdish under AFAD auspices is another reason given for avoiding the government camp. Lack of food is the main problem facing the refugees who prefer to remain outside of Turkish jurisdiction, says Ferzad. "Food not controlled by the government isn't reaching the camps; so the refugees live on a meager diet of just rice and beans. There are urgent health issues, too – flu is everywhere; 40 percent of the children have diarrhea; and there are skin diseases too, brought on by lack of nutrition." 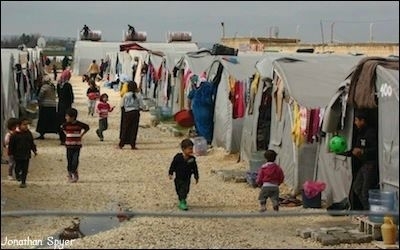 Despite the shortages, the camps maintained by the Kurdish relief organizations offer basic but adequate facilities – tents, washing areas, schooling in Kurdish for the children. Disused houses in Suruc have also been occupied by some refugee families, seeking shelter from the elements. Conditions here are primitive in the extreme. In one structure I visited, four families – 40 people in total – were living together in one large room, with just a blanket placed over the open doorway. One of the families, the Shaikhos of Sheran village, are still mourning the loss of their eldest son, 19-year-old Mahmoud, who was killed when he stepped on a land mine while crossing the border to escape the advance of the jihadists last October. Mahmoud's younger brother, Fadel, 13, was with him when he was killed; Fadel survived the explosion, but lost both legs. Now he lives with his family in the large, empty shell of a house in Suruc, a thoughtful-looking boy who tries but does not quite succeed in smiling. The plight of the Kobani refugees is just one element of the vast problem of people displaced by the Syrian war. No end to the war appears in sight, and spring looks set to bring little respite to the refugees on the Turkish- Syrian border. Jonathan Spyer is a senior research fellow at the Global Research in International Affairs (GLORIA) Center, and a fellow at the Middle East Forum. He is the author of The Transforming Fire: The Rise of the Israel-Islamist Conflict (Continuum, 2011).